Engr. Mudassar Azam is currently serving as an Assistant Professor at Institute of Chemical Engineering, University of the Punjab. An alumnus of the same institute, he has done his Bachelors and Masters with distinctions and is pursuing his PhD degree from Technical University of Vienna, Austria with concentration of research in Incineration (Waste to Energy). He has number of publications in well renowned international journals. 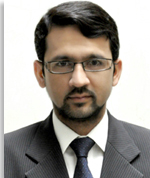 He has top notch experience in his field and has previously served the COMSATS Institute of Information and Technology and Fauji Fertilizer Company Ltd. Apart from teaching, He is the Focal Person for Career Counseling and Placement Center at University of the Punjab as well as the Sports and Co-curricular activities In-charge of the Engineering Faculty. Mudassar is distinguished for his continual aid and assistance to the young graduates at not only his university but several other institutes of Pakistan. He has trained more than 6000 students for the professional line by imparting industrial knowledge, interview techniques, job hunting and CV formation skills through countless seminars and forums.